Every good photo has a subject, and in a great photo the subject is what attracts the viewer immediately. In some photos, the subject may be quite obvious … an expressive face, a colorful Autumn landscape, or some sort of dramatic news event. And in others, the subject may be more subtle – a pensive mood, a mischievous glance, or perhaps just the feeling you experience while viewing something you like. You may want to ask yourself what exactly am I trying to communicate about this subject. Is my subject a single object or person? Or is it many things combined so as to express a single idea? Am I conveying a mood or just capturing a moment of beauty in nature? Usually you will want to ask these questions silently to yourself, but who knows … if you ask out loud you might get some interesting people shots. Your camera will record everything it sees when you snap the shutter, so you must decide what the subject in your photo will be and what you want to say about it. When training your eye and mind it can be helpful to give conscious thought to these questions, but in time this will begin to happen subconsciously. Once you’ve given some thought to choosing your subject, the next step is to decide what will help emphasize the subject and what will distract from it. Things that make your message clearer should be included. Anything unnecessary or that makes the message less clear should be excluded. If something can’t be excluded then it might need to be played down in a way that makes it less distracting. Whenever possible, shoot the subject from different angles, move around the subject and get closer or farther away. By exploring a variety of possibilities, you increase your chances of getting the best shot. Quite often you’ll find that a single scene contains several photos, each with its own subject and message. By exploring your subject in more depth, you will often discover great shots that are overlooked by many other photographers. Take a lot of shots too. Sometimes the answers to those questions suggested above won’t be so obvious until you actually begin shooting. Just get started and often the subject will reveal itself as you continue to explore different ideas. Experimenting is one of the things that makes photography such great fun. Getting involved with your subject can lead to some wonderful discoveries and that’s often when those WOW shots reveal themselves. So don’t shy away from experimenting … nobody has to see your results unless you want them to. Just for fun I thought I’d take a single shot and using different cropping try to convey a different message. Now this is just using cropping after the fact, but the same idea can be done when actually shooting … in fact that’s usually the best way to do it. 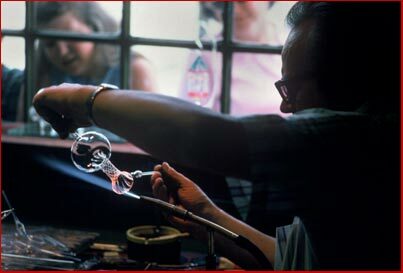 In this first example I have a shot of a glass blower sitting at his workbench located in front of a window where people can watch him at work. The people looking in help to convey this idea. The workbench includes other glass items, indicating the variety of objects he has produced. Working in front of this window is a clever way to draw attention to his shop and probably helps pull folks inside to see and buy his products. In this second example I’ve moved in closer, eliminating some of the outside information. More attention is now on the glass item he’s working on. Note how the girl’s gaze and the craftsman’s gaze both lead you back to the glass. One issue with this shot that weakens it is the bright window area at the top. While it helped in the first example, it is very distracting in this second composition. When shooting this scene, had I been able to shift my position slightly I may have been able to block out much of the window. A good lesson to keep in mind when you’re shooting … scan the entire scene for distracting elements. In this third example I’ve simplified the shot even more. Moving in very close, the subject now becomes more about the art of hand blown glass. By eliminating everything but the hand, torch and glass item, it is no longer a picture of one individual glassblower. It is now a statement about the craft itself. While using 3 different crops helps demonstrate how the way you compose your subject affects the message of the photo, it would usually be better to actually shoot each of these compositions as separate photos. Your subject may or may not be the physical objects in your photo, but the idea that they convey. If you are clear on your message, you’ll be able to simplify your composition. It’s important to emphasize your subject and eliminate or play down anything that distracts from the main idea. Check the entire frame for distracting elements. Remember, our mind tends to ignore what isn’t important, but the camera lens doesn’t. Experiment with a variety of angles and views as there may be many different possible shots, each with its own subject and message. Be involved with your subject and you are more apt to get photos that others may miss.